The introduction continues by chronicling the growth of the popularity of calligraphy and the lettering arts, discussing the tools and materials and Speedball products, and explaining calligraphic terms. The Alphabet Styles section gives stroke-by-stroke instructions for 15 alphabet styles: Monoline, Roman, Foundational, Uncial, Versals, Carolingian, Blackletter, Gothicized Italic, Italic, Pointed Pen, Neuland, Flat Brush, Pointed Brush, Italic Handwriting, and Hebrew. The Techniques section includes tips and techniques, spacing, layout and design, information on reproducing artwork, and designing business cards, invitations, greeting cards, formal envelopes, certificates, calligrams, logos and designs. The Artwork section wraps up the book with 15 pages of beautiful and inspirational artwork from many lettering artists. Other examples are sprinkled throughout the book, with over 100 artists represented in all. 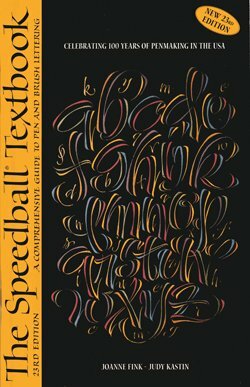 The Speedball Textbook is an excellent compact introduction to calligraphy and a book you’ll be delighted to have in your library to learn from and enjoy.